Oxford zoologist Richard Dawkins insists: “Scientific beliefs are supported by evidence, and they get results. Myths and faiths are not and do not” (33). Harvard biologist Richard Lewontin says something similar—namely, that the “social and intellectual apparatus, Science,” is “the only begetter of truth.” These scientists operate according to the “warfare model” of the Christian faith’s relationship to science, and they assume the ideology of “scientism,” which everyday Christians often wonder how to address. Thanks to Biola University’s J. P. Moreland, an important, accessible resource is here! Moreland is considered one of the top 50 most influential philosophers alive today. Not only has he written books and articles at both scholarly and popular levels; he also has a passion to see people come to Christ, to move them toward Christlikeness, and to encourage them to experience the power of the Spirit. For these and many other reasons, Moreland has been a great gift and blessing to the church. In his most recent book, Scientism and Secularism: Learning to Respond to a Dangerous Ideology, Moreland reminds readers that the Christian faith is a matter of knowledge, which has the support of reason and evidence; caricatures notwithstanding, faith isn’t mere emotion or opinion (38). The Christian faith is a knowledge tradition that once furnished a unifying vision that helped advance Western civilization, education, and science. The loss of a unified vision in our modern educational system has led to fragmentation. This includes the dichotomy between facts (public, objective) and values (private, subjective) as well as diminishing the humanities in favor of the sciences (42–46). Of course, the problem isn’t with science itself (modern science was established by Bible-believing Christians). The key issue is the philosophical stance of scientism; this is one of the three major planks of naturalism, the other two being determinism and materialism. Because of these challenges, Moreland urges parents, pastors, and other Christian leaders to think more Christianly about the world and about science in particular. They must also faithfully teach the next generation about the solid intellectual foundations to their faith and enable them to respond to the prevailing secular views that undermine Christian faith and encourage departure from belief in God. Moreland’s book alerts us to the pernicious influence of scientism, which is anchored in a naturalistic worldview. Naturalism claims that nature alone exists and that matter alone is real (materialism). Thus, this worldview rules out God, the soul, angels, and a post-mortem existence. Scientism insists that “the hard sciences—like chemistry, biology, physics, astronomy—provide the only genuine knowledge of reality” (24). Crossway (2018). 224 pp. $16.99. Rigid adherence to scientism—as opposed to a healthy respect for science—is all too prevalent in our world today. Rather than leading to a deeper understanding of our universe, this worldview actually undermines real science and marginalizes morality and religion. 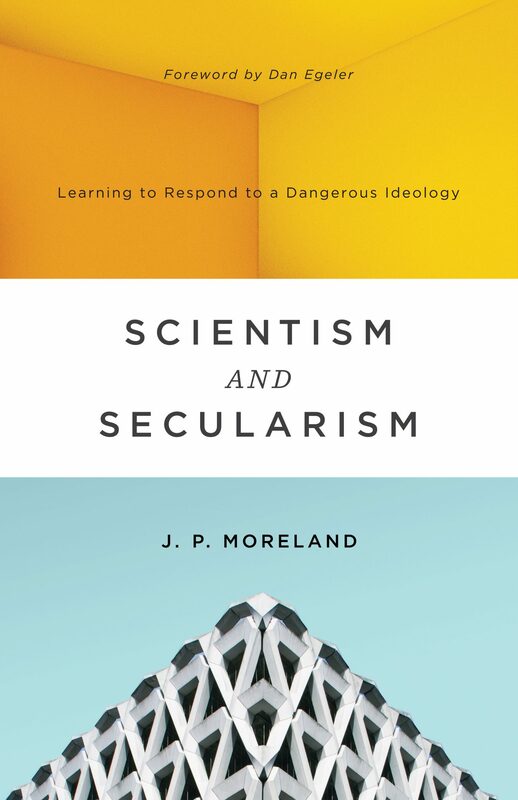 In this book, celebrated philosopher J. P. Moreland exposes the self-defeating nature of scientism and equips us to recognize scientism’s harmful presence in different aspects of culture, emboldening our witness to biblical Christianity and arming us with strategies for the integration of faith and science—the only feasible path to genuine knowledge. Scientism has two versions. The strong version says that science alone gives knowledge; the weak version claims that science is the best way to know. By contrast, ethics and “religion” are private and subjective—not the stuff of real knowledge. (How often have we heard the challenge, “Can you prove it scientifically?”) As a result, the Christian faith has become marginalized; for many, it is outside their “plausibility structure” and is no longer treated as a knowledge tradition. It has also led to moral chaos (since there can be no ethical norms or intrinsic human dignity) and to nihilism (since there can be no purpose to the universe and no telos or goal toward which humans ought to strive). Modern science was founded by Christians. As Galileo said, when we properly interpret the world of God (science) and the Word of God, they won’t be in conflict with each other. The real problem is scientism, which actually strips away our very humanity—free will, morality, human dignity, purpose, beauty, and even consciousness. Yet Christian parents are often ill-equipped to address this pervasive and corrosive ideology that their children encounter in high school and university settings. There’s good news, though. For all of the bluster and puffery in realms scientistic, this methodology is both self-refuting and defies commonsense beliefs. Insisting that science is the only way to know (strong scientism) is not something known scientifically (how can you scientifically prove that all knowledge must be scientifically provable?). And if science can’t inform us about the reality of ethics or free will or human dignity, so what? Science has built-in limitations, but some moderns have placed a burden on science that it cannot—and was never meant to—bear. Theology, philosophy, and other sources of knowledge not only help supplement what science can show, but they can also enrich our study of science. We have all manner of non-scientific knowledge. The logical laws and mathematical truths required for science are necessary truths—as opposed to the contingent truths of science. And in order to study the material world, the non-material realm of consciousness (first-person, directly and privately accessible awareness) is required. And the reality of moral knowledge (e.g., the wrongness of torturing babies for fun) is basic to our proper thinking and function as human beings but doesn’t belong to the realm of science. Moreland raises an important point about methodological naturalism. What is it? Well, methodological naturalism is distinct from metaphysical or philosophical naturalism, which is clearly opposed to theism. By contrast, some theists hold to methodological naturalism, which maintains that science should be naturalistic or atheistic in its methodology. God’s existence and action are irrelevant for doing science properly; only natural or physical processes, entities, laws, and principles should be invoked to explain a physical event. These theists are concerned with the “God of the gaps” charge: in the past, the “God explanation” has been used to plug the holes of our ignorance, but as science advances, appealing to God to explain physical events becomes increasingly irrelevant. Moreland addresses some of these concerns. These include distinguishing between empirical science,—which studies repeated, verifiable natural patterns such as chemical reactions—and historical science, which focuses on nonrepeatable events. Methodological naturalism has problematic implications, especially for theists. For one thing, “the God hypothesis” can’t be used to explain the beginning of the physical universe. Nor can demonic activity be invoked to explain the most erratic or bizarre physical human behaviors, despite the Gospels’ testimony. But the straitjacket of methodological naturalism is problematic not only for biblical and philosophical reasons. For one thing, there simply is no clear line of demarcation between the scientific and non-scientific. And why can’t personal agency—divine or human—be an appropriate category to explain physical events? After all, an act of God isn’t a law of nature. For what non-question-begging reason must we exclude divine design as the explanation for the universe’s astonishing bio-friendliness or the cell’s astonishing complexity? And despite the rejection of design as “unscientific,” some naturalists will appeal to the existence of multiple worlds (“surely one of these worlds will produce the conditions necessary to permit, create, and sustain life”). But notice that there is no scientific evidence for such worlds; so why favor this explanation over the God hypothesis? Or consider how some of these scientists will also appeal to the “illusion” or “appearance” of design. Now if the universe or organisms appear designed, perhaps this is because they’re actually designed. Science just can’t help us determine between the apparent and the actual. This is a philosophical or theological judgment. Methodological naturalism is too constrictive. In addition, some scientists create their own “naturalism of the gaps”: No matter how much the apparent evidence for design or divine action, we should always resort to what can be explained by natural processes. Rather than seeking the best explanation, they seek the best natural explanation. The Christian philosopher Alvin Plantinga’s book Where the Conflict Really Lies emphasizes how faith in God and science are deeply congruent while conflicting only superficially. By contrast, naturalism and science are superficially congruent but are in deep conflict. In the same spirit, Moreland estimates that “95 percent of science and theology [is] cognitively irrelevant to each other” (e.g., “as a Christian, it doesn’t matter to me whether a methane molecule has four or fourteen hydrogen atoms” ). Three percent offers positive support for Christian teaching (e.g., the Big Bang, the second law of thermodynamics) while only 2 percent may seem to undermine Christian theology (i.e., certain interpretations of Genesis 1–11). Keeping the main thing the main thing will help believers to become more adept at faith-science integration—in the home, in the church, and in our academic work. Furthermore, Moreland reminds us of the social pressure within the scientific community to conform to a naturalistic philosophy as well as a naturalistic methodology when doing science. Also, we shouldn’t lose sight of the fact that people have personal rather than evidential reasons for rejecting God (e.g., NYU atheist philosopher Thomas Nagel, who doesn’t want there to be a God). So when the secularist demands that we “scientifically prove” the Christian faith, we don’t have to play that game. The scientistic assumption that all knowledge must be scientifically provable isn’t scientifically provable. It’s a philosophical claim. Further, even though we may not have scientific training, we can still engage people in the sciences at a deeper level: The scientific enterprise depends a great deal on philosophical assumptions and reasoning (“science” used to be called “natural philosophy”), and a lot of naturalistic scientists like Dawkins and Lewontin make basic philosophical mistakes that we can easily catch. The scientistic assumption that all knowledge must be scientifically provable isn’t scientifically provable. It’s a philosophical claim. Yes, the Christian faith is “a highly rational worldview with much evidential and argumentative support” (192), and Paul certainly appeals to the historical evidence for Jesus’s bodily resurrection (1 Cor. 15). But scientism as a method of knowledge is incoherent. Given what naturalism has on offer, we have no good reason to reject the Christian faith in light of what we know from science.